Processes around auditing, self assessments and inspections can be easily configured in e3 to digitise and centralise the information being collected. Daily inspections on a range of data points from temperatures to visual checks are important gauges for operations and production teams in process intensive industries. The list of items that need daily inspection from physical assets such as pumps, lighting, vents and cooling systems to data inputs such as pressure, temperature and flow rate can create quite an administrative burden on teams carrying our the work. Routines that are completed daily ensure that personnel are on plant and are aware of changes in conditions, but complex and sometimes onerous form filling can fatique and disengage employees carrying out the work. In e3, NiSoft have built in the ability to capture almost any document or form and build the require workflows and data around that to ensure that tasks such as audits and inspections are as efficient and intuitive as possible. 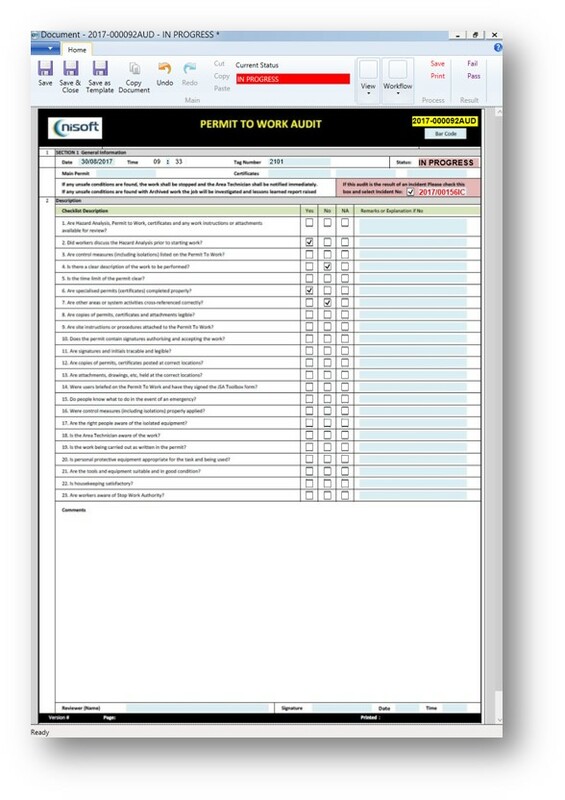 Interfacing with the main e3 product, the mobile inspection functionality can allow for teams to indentify various tasks that need completed on plant, allow the engineer to take the relevant documents on plant and deliver the information back to e3 for the reporting and auditing of routines.